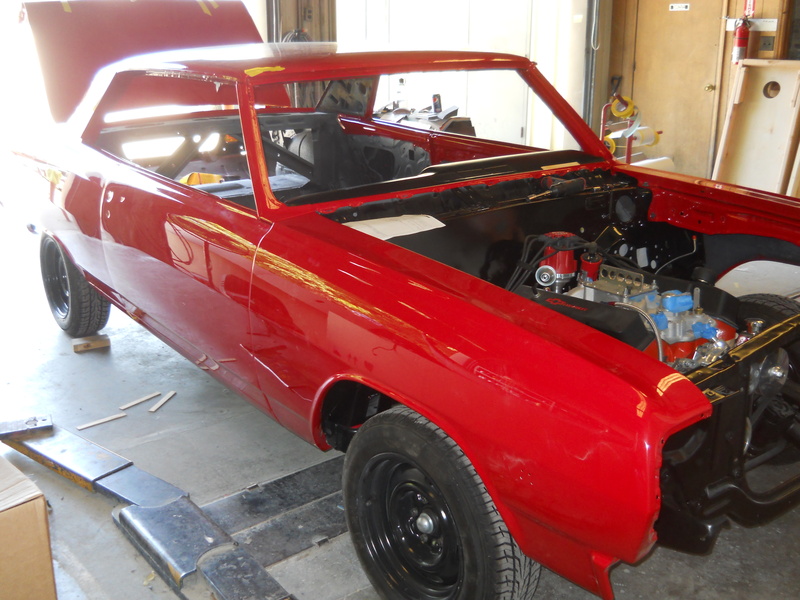 At long last, after months of sweat and toil, sanding and painting, this 1965 Chevelle is finally finished. Well, finished as far as JMC AutoworX is concerned. Today we installed the hood and aligned the fenders, the last two items to finish before the car could be turned over to the owner. 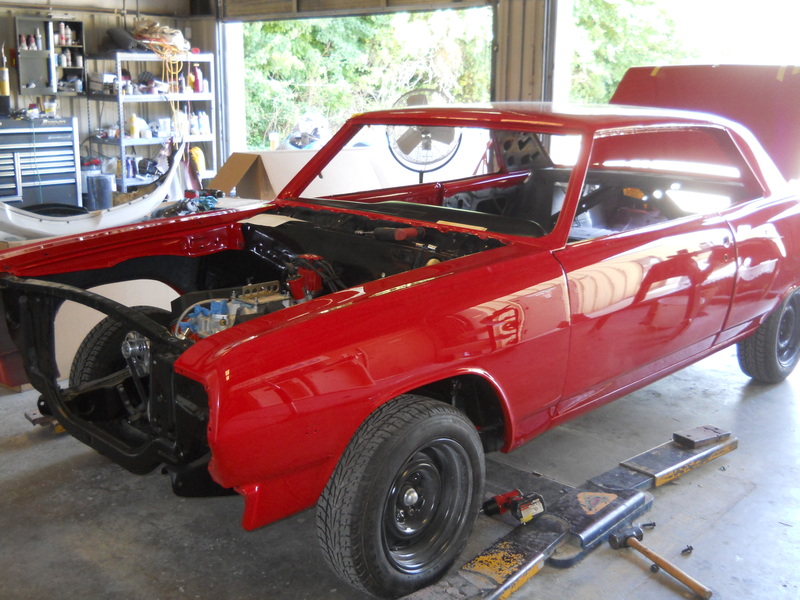 You can see me working on the hood latch in the first photo, finishing up the last few details. The rest of the photos, numbers 2-5, are of the old girl, out enjoying the sun, turned out in her very best. The paint is as perfect as I can make it. The body panels are aligned and the gaps even. In short, the car is ready to go to the next step … installation of the interior, a few remaining mechanical issues and final trim out. Those operations will all be performed by the owner. I kind of hate to see the ol’ girl go. She has been in the shop a while, taking up space and getting in the way. But just like your kids, you wouldn’t trade the experience for anything. I mean, look at it! 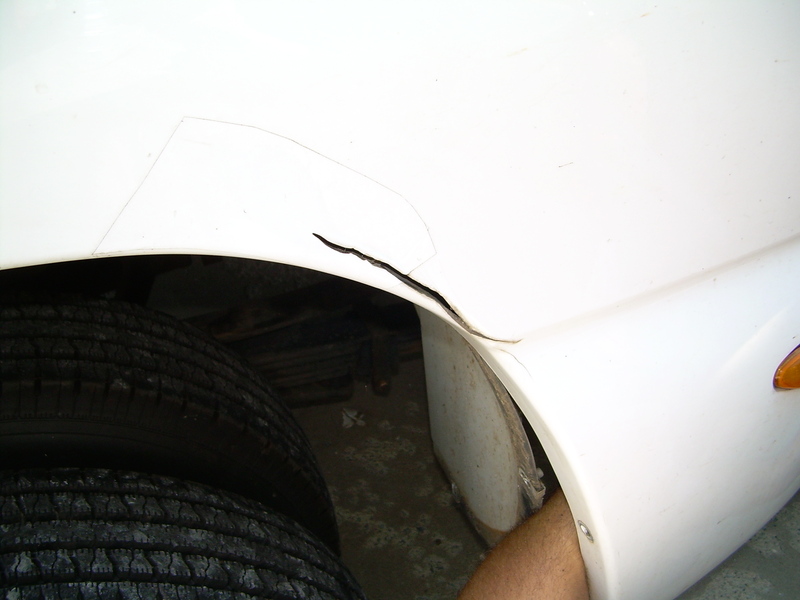 I derive a great deal of satisfaction from taking a car damaged in a wreck and making it whole again. But nothing compares to the feeling I get when I wipe down a High Performance Finish car for the last time, the last time I feel the slickness of the paint before turning the car over to the owner. Now that is satisfaction for a job well done. Next week a roll-back will come and take the car away. I won’t say I will shed a tear when it leaves, but like saying goodbye to an old friend, I hope to get to see it again. Soon. 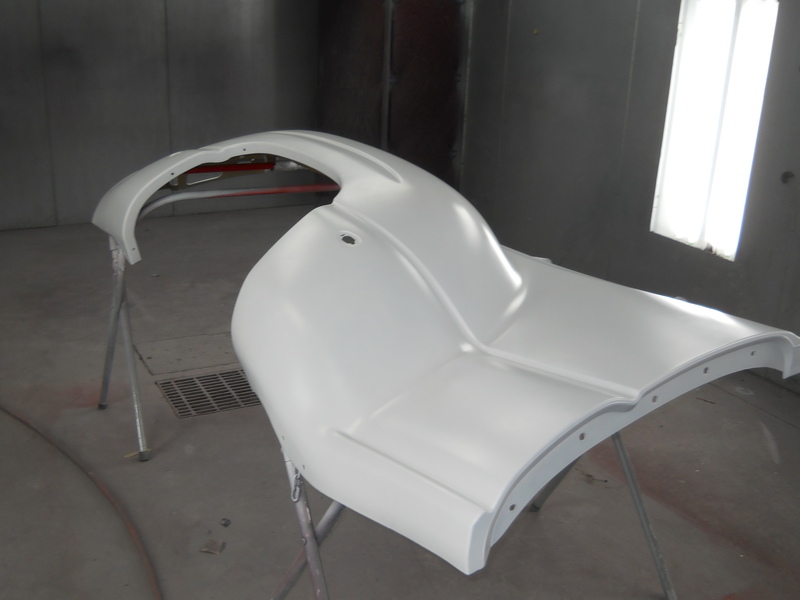 Yesterday we slung a couple coats of paint on the bedside of this mighty Chevrolet pickup. 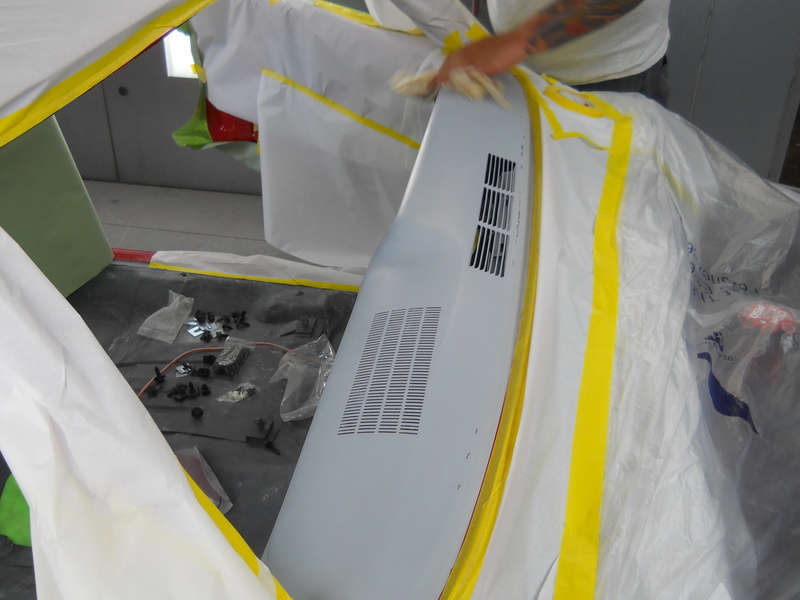 The paint, having dried overnight, allowed use to do a quick switch0out of the besides today. 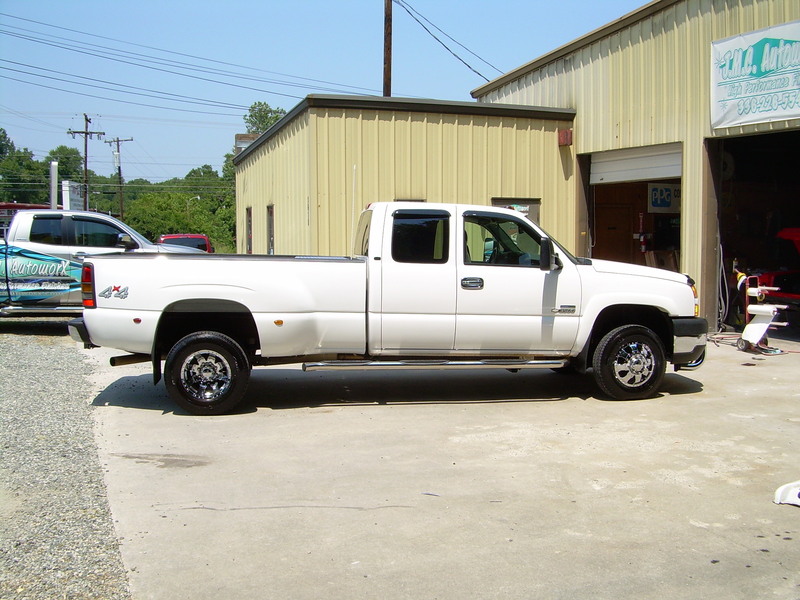 The first picture shows the truck as it arrived at the shop. It doesn’t look to bad, but you can see in the second photo there was some damage … too much damage to try to repair. The third photo has Chase (in red) and me working to remove the bed side. The side isn’t heavy, but because it is made of plastic it is rather floppy and hard to handle, especially when you have to raise it up over your head to detach it from the truck. Having two or three sets of hands makes handing something like this much easier. 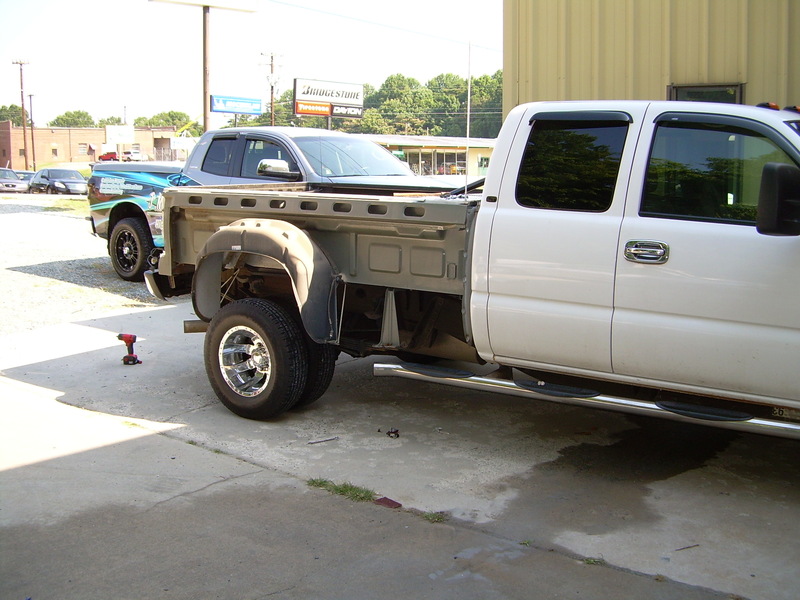 The fourth photo shows the truck with the side removed. It’s sort of like looking at it’s underpants, except not as embarrassing. After removing the bedside, we installed the new, freshly painted, bedside by doing everything in reverse. In the fifth photograph we have raised the panel over our heads, inserted slot “A” in channel “B”, and with a little beating and banging to make everything line up, lowered the side into place. The result is in picture number six. Then came the fun part, fitting the bed around the wheel well. Where getting the side off the truck was easy because it just pulled loose, putting it back required a little more finesse. You can see in picture seven that I am using a pair of flat bladed tools used to remove pins to walk the edge of the bedside into place. 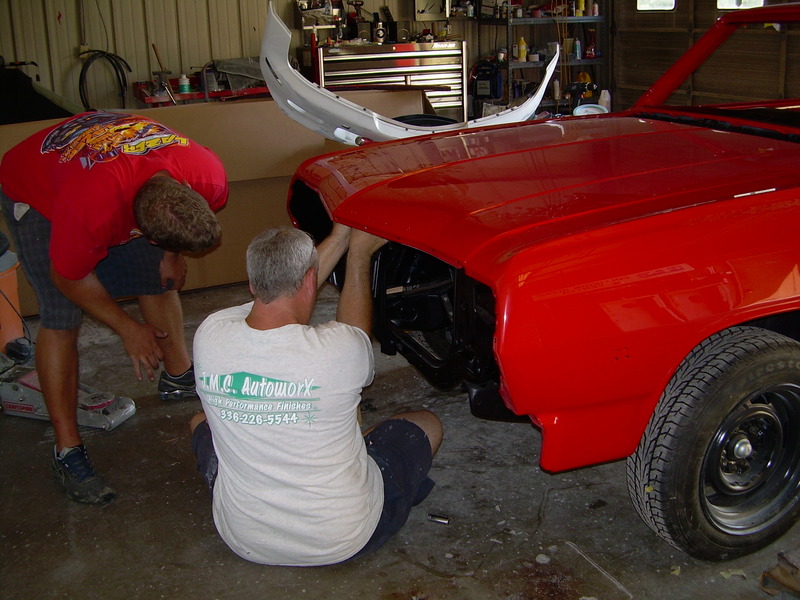 Chase is pushing and pulling as needed to have the lip of the fender slip into place. I’ve done so many of these trucks that it isn’t hard to do … I’ve learned all the little tricks to make it go smoothly, but it took as long to fit the fender lip into place as it did to mount the entire side of the truck. 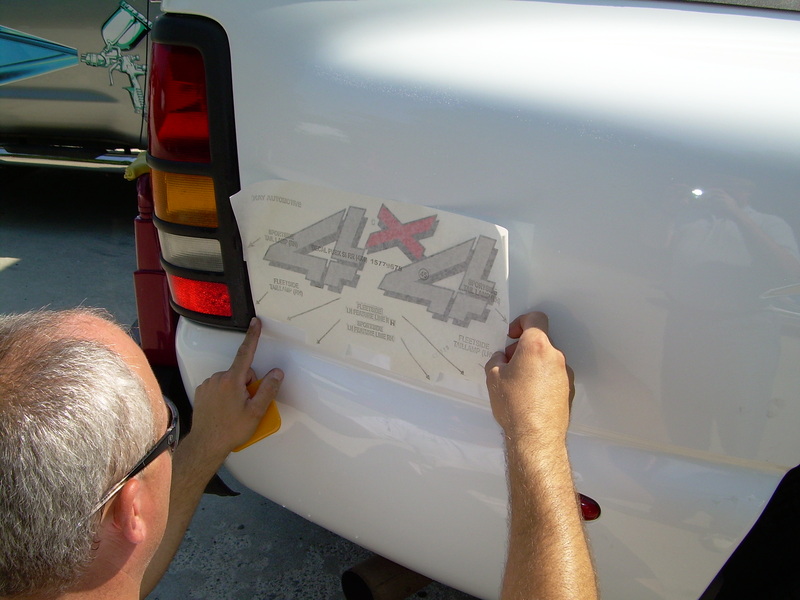 After bolting the bedside down I added the finishing touch … reapplying the 4 x 4 sticker on the fender. This another one of those tasks that seems harder than it is. Because the sticker has all the body lines marked on the backing, it was a simple matter of a few squirts of water, align the arrows and notches, and pull off the backing. Pictures eight and nine show the process. The last photo, number ten, show the truck all cleaned up and ready to go to the beach, which is where it is headed as soon as it leaves the shop. It’s a good thing we got the truck in and out today … everyone wants to look good at the beach, and this truck is looking its best indeed. 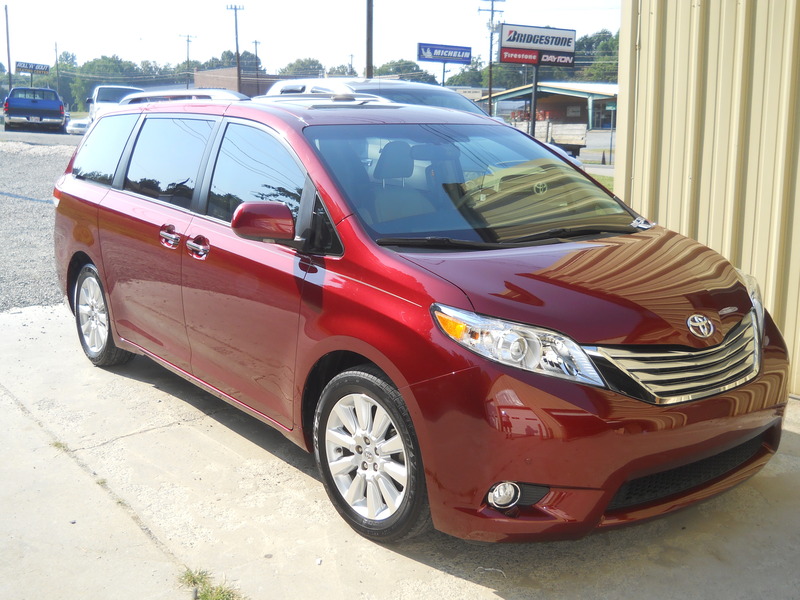 This Toyota Sienna, a spaceship of a minivan loaded with every conceivable option, is ready to launch. Or, less metaphorically, ready to go home with its owner. 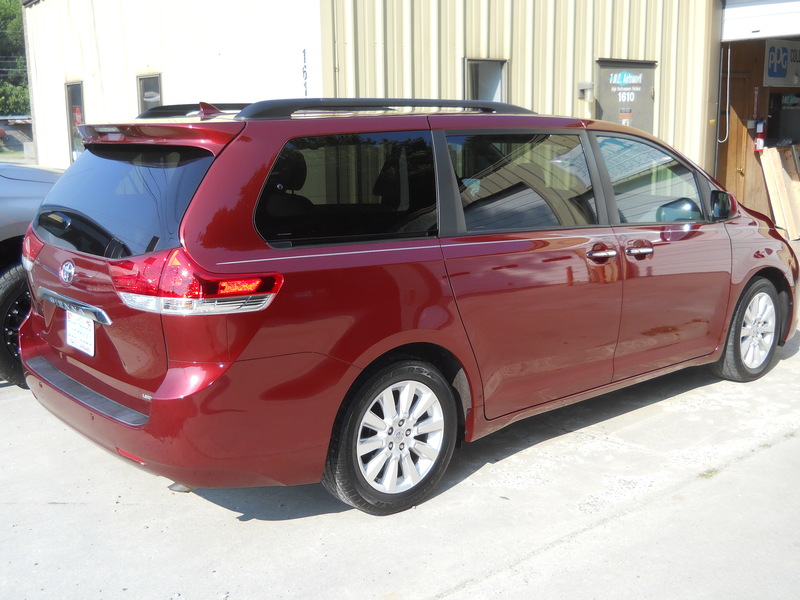 A minivan isn’t a viable option for me … I need a truck for my business, but after driving this minivan I can sort of see the appeal. This car rides good, drives good, has good power … and most importantly, had enough do0dads and whatizts to keep me entertained for hours. Yes I know … I am easily amused. On July 12th of last year I saw the hottest tempreture of the year in the shop at 109°. 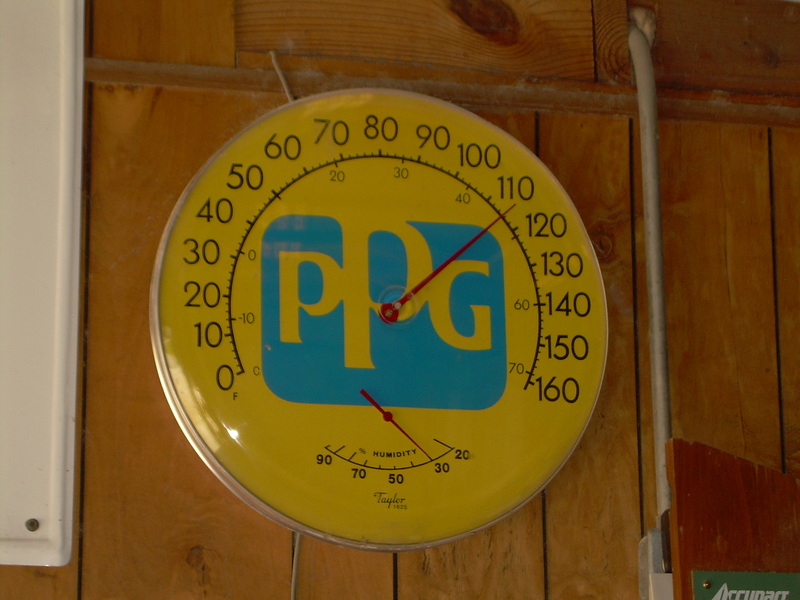 Today, we set a new record … 115°. You will notice that the humidity, the small needle at the bottom, is low at only 30%. Better than having the humidity at 70%, but all it really means is the shop is like an oven. And no, the thermometer isn’t displayed because of masochistic tendencies … rather I need to know the temperature and humidity in order to properly mix the paint. So, enjoy working in an oven for eight or nine hours? 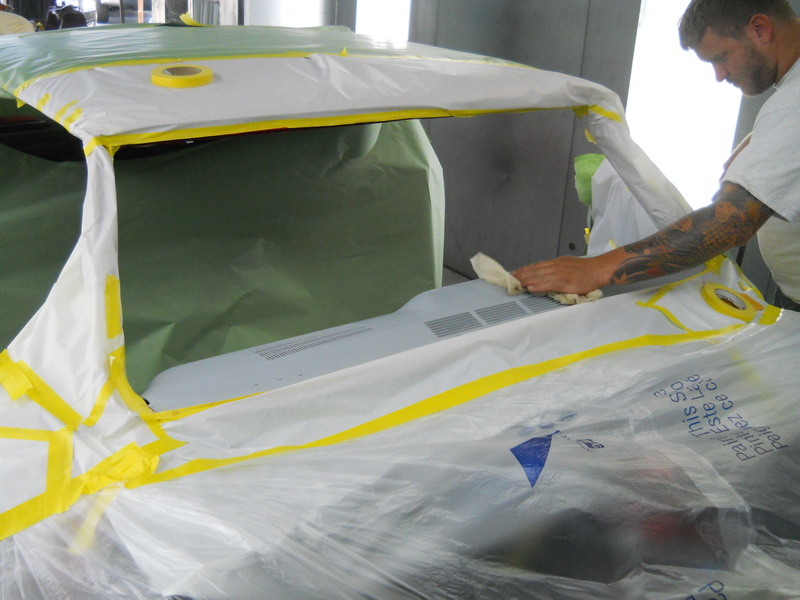 They you too can enjoy a glamorous career in auto body repair. What we have here is a bed side from a mighty Chevy dually. The original bed side, though not significantly damaged, is damaged beyond repair. So here is the the new one. 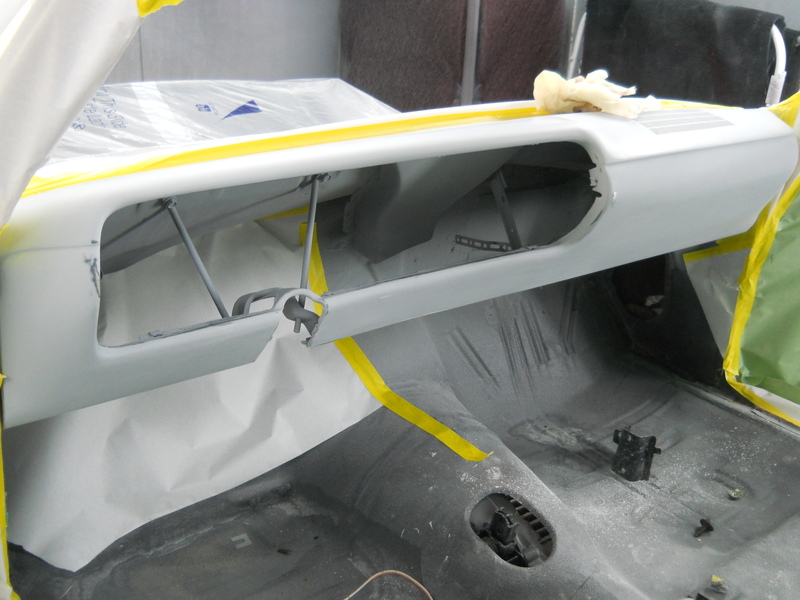 The first photo shows the side after the base coat has been applied. It doesn’t look too bad in this photo because white is a very forgiving color, but the base coat has dried quite flat. 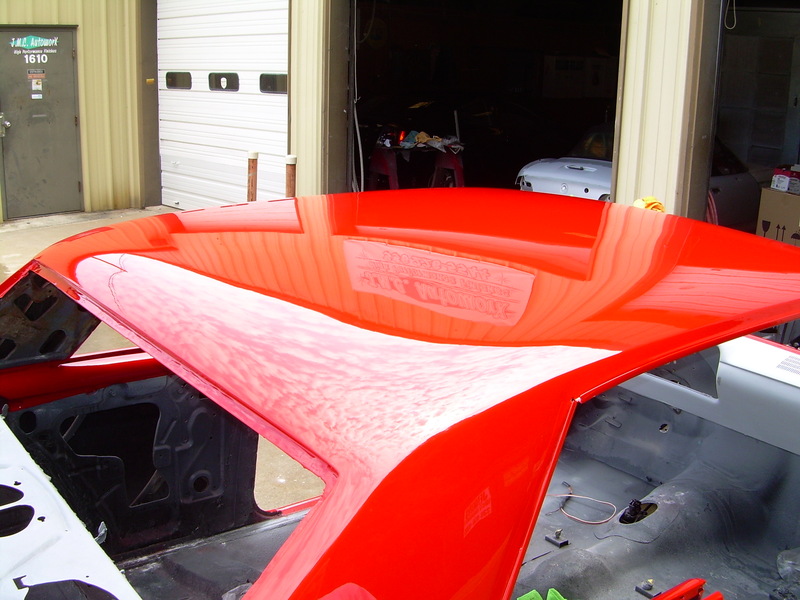 This is normal for base coat because it is the clear that adds the pop and sizzle to the finish. The second photo clearly (no pun intended) demonstrates what I mean. The first photo looks, well, ok … the but the second one show how the clear coat gives the paint the depth and shine one expects. Tomorrow the rest of the truck comes to the shop so we can remove the damaged side and replace it with this one. A little one day job to finish out the week on a high note. 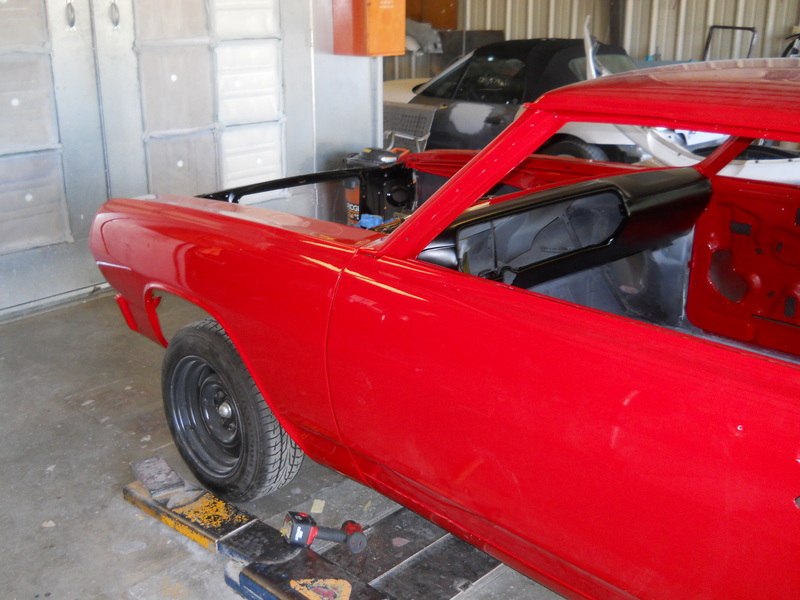 Today we hung the fenders and doors on the Chevelle. This pretty much completes the portion of the build that JMC AutoworX is responsible for. 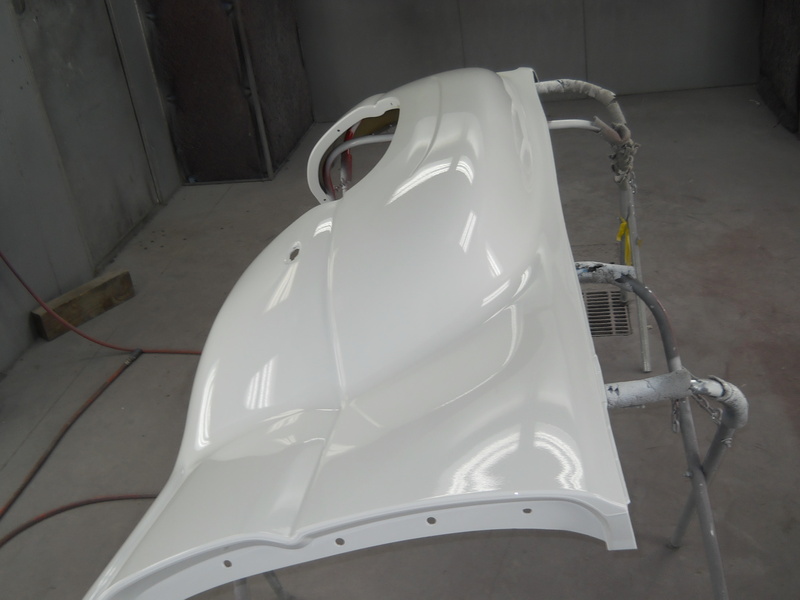 We will do the hood and inner fenders tomorrow. The owner will pick this car up and take it away for the installation of the glass, interior, wiring … along with the final installation of the trim. 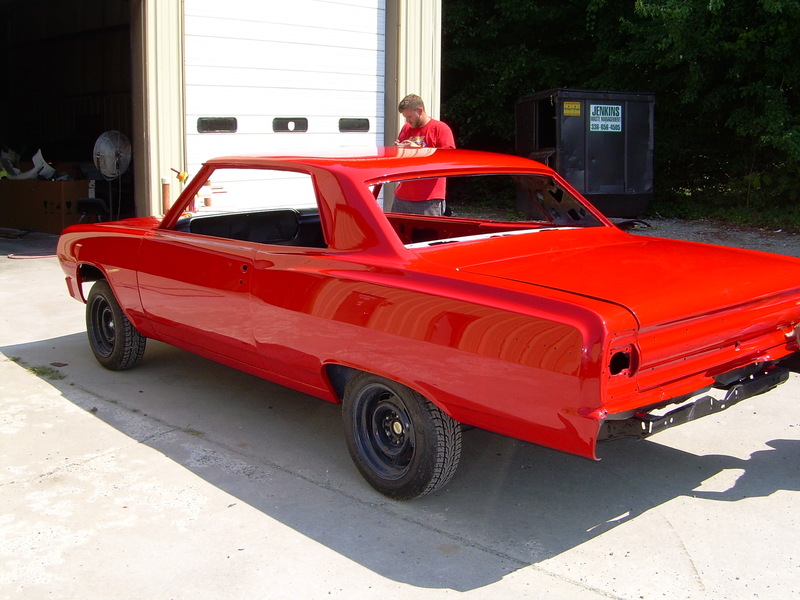 Seeing one of these High Performance Finish cars leave the shop is kind of like seeing your kids leave home. You are so proud … but it is kind of sad too. 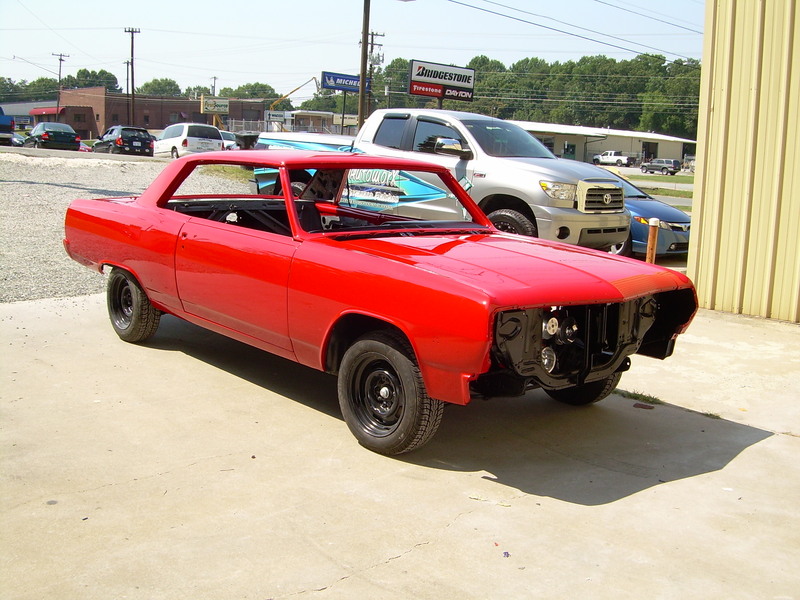 We are down to the last couple of items on this Chevelle … then I will be bidding it a fond farewell. One of those last items is painting the dash. The gray … it just doesn’t do anything for me. I’m thinking a nice semi-gloss black. The first photo shows the car masked off. It would be … disappointing … to get the black paint on the red. I think the customer would notice if I were to do so. The next two photos, numbers two and three, show Chase wiping the car down with a tack cloth. A tack cloth is a lint free cloth treated with a chemical to make the cloth slightly sticky. 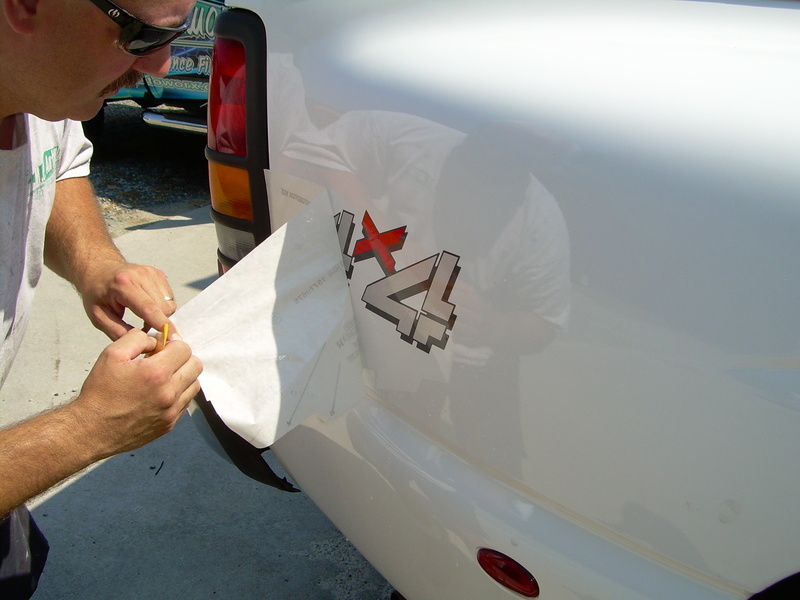 The stickiness picks up any dust or debris and removes it from the car. 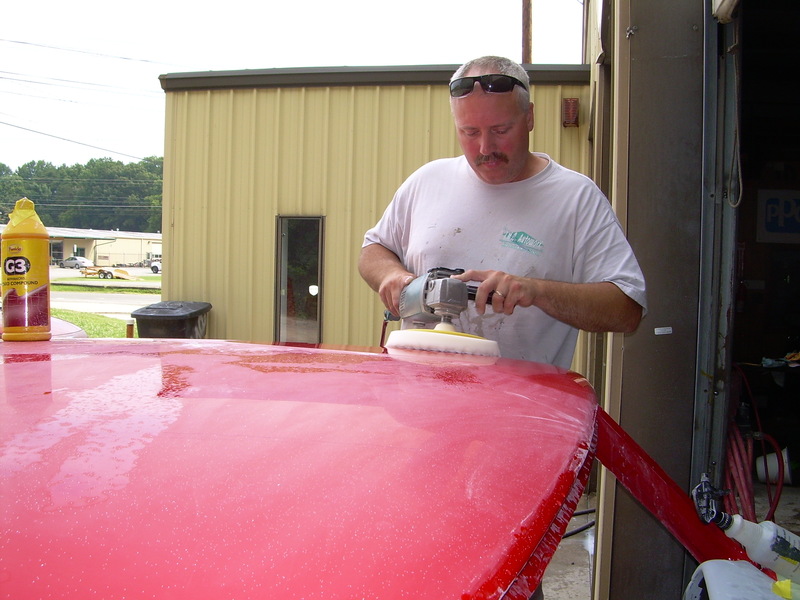 A quality paint finish depends on the preparation, and making sure the surface is clean is all part of the preparation. 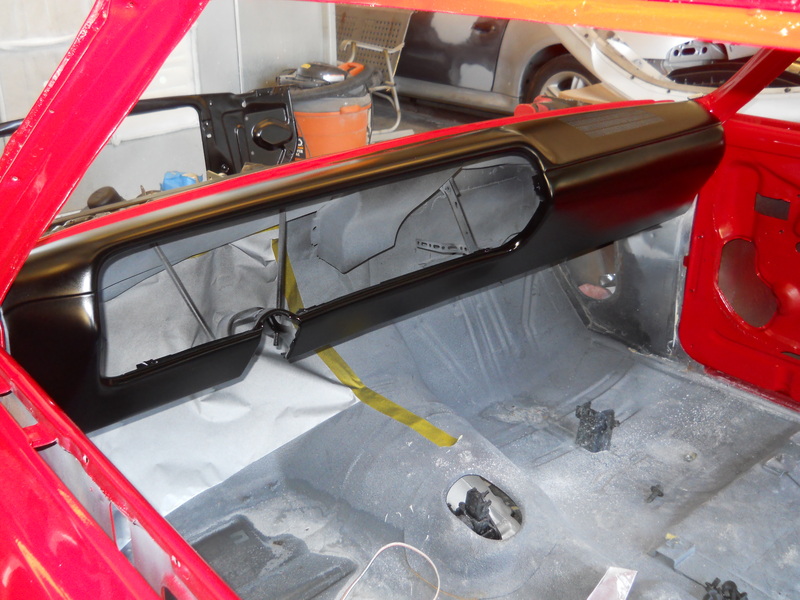 The next two photos, numbers four and five, show the dash after the sealer has been applied. 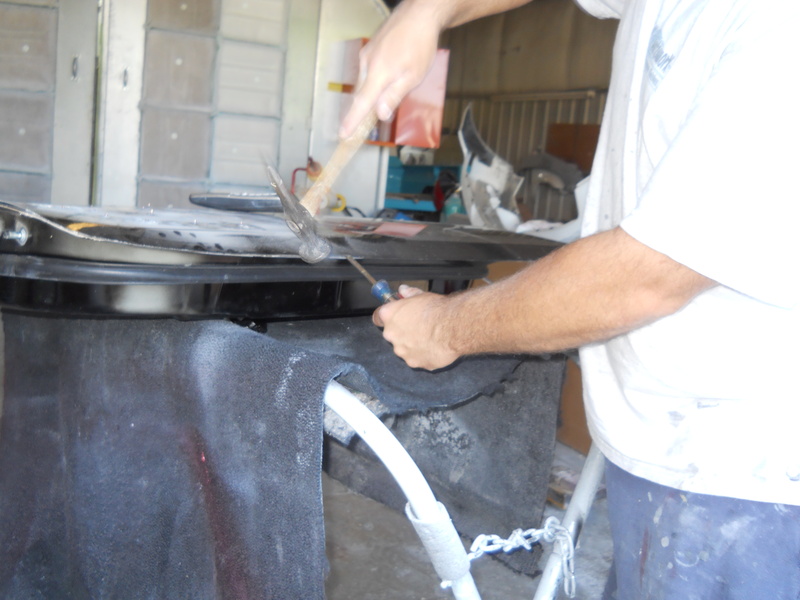 The sealer seals all the materials below and prepares the surface for paint. 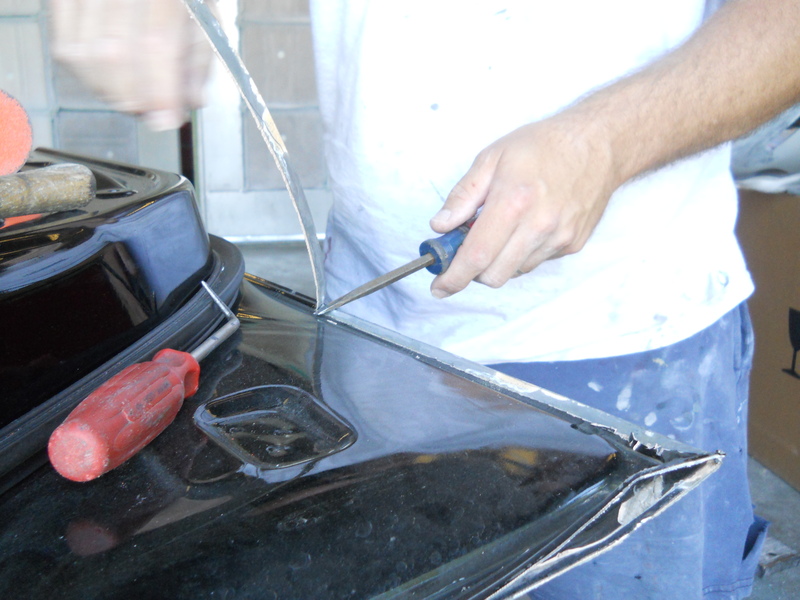 The sealer comes in seven shades of gray, from almost white to this very near black color. Each paint color has one of these specific grays assigned to it. Since the dash is going to be painted black, I am using the darkest of the seven grays. Pictures six and seven show the dash after the paint has been applied. 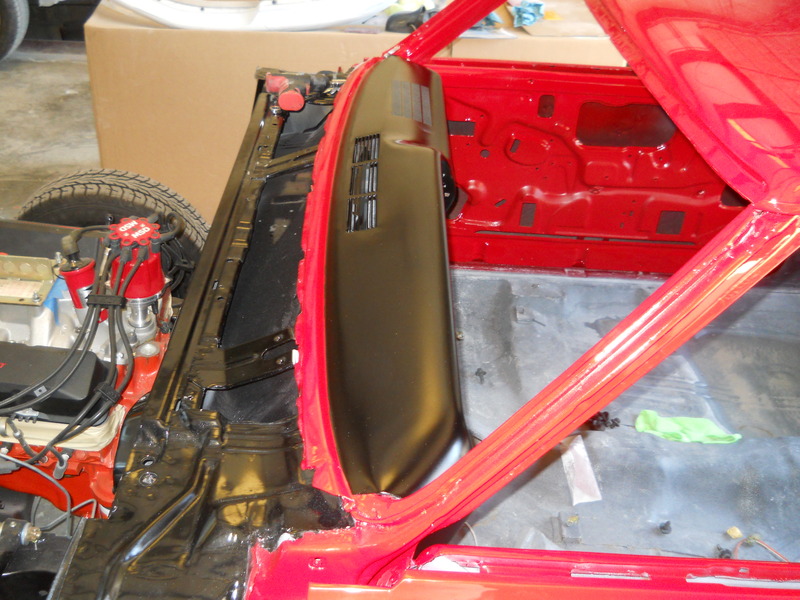 Unlike the red, this dash is painted with a semi-gloss paint. It wouldn’t do to have the dash so shiny that all you could see is in the glass is … well … the reflection of dash. The last two photos, numbers eight and nine, show the car unmasked so you can see how the dash looks with the red of the car. I like the contrast between the red and black. This finishes the painting. And it finishes it up with a dash of style I think. 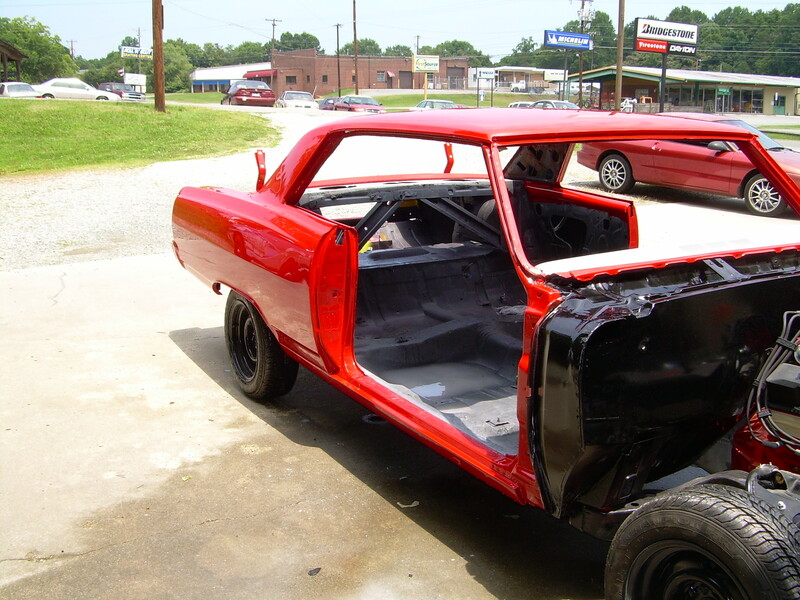 All that is left is the installation of the doors, fenders, hood and trunk lid, then the car will be ready for the owner to pick it up. I will hate to see it go, but it will make room for the next High Performance Finish project … and I can’t wait to get started on it. 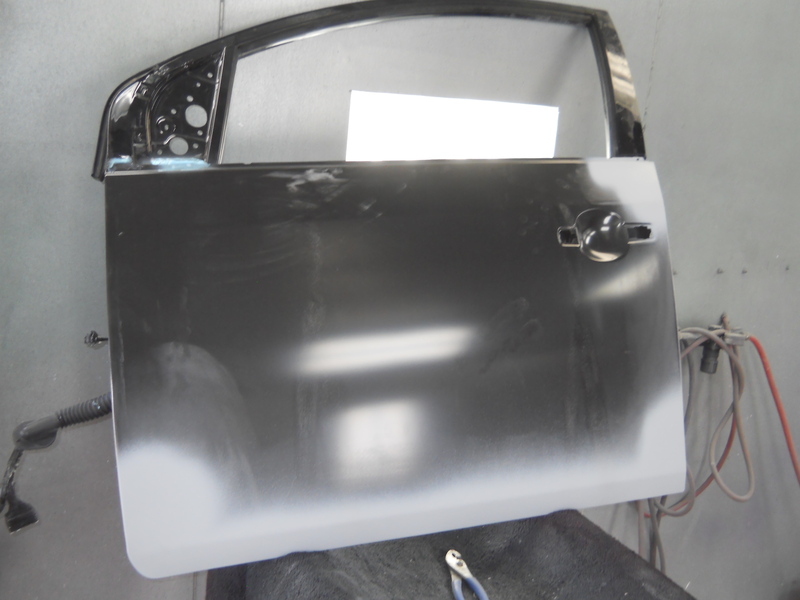 After replacing the door skin on this Sentra, we had to paint it. The skin was black from the factory, but that was just the rust preventative and not paint. 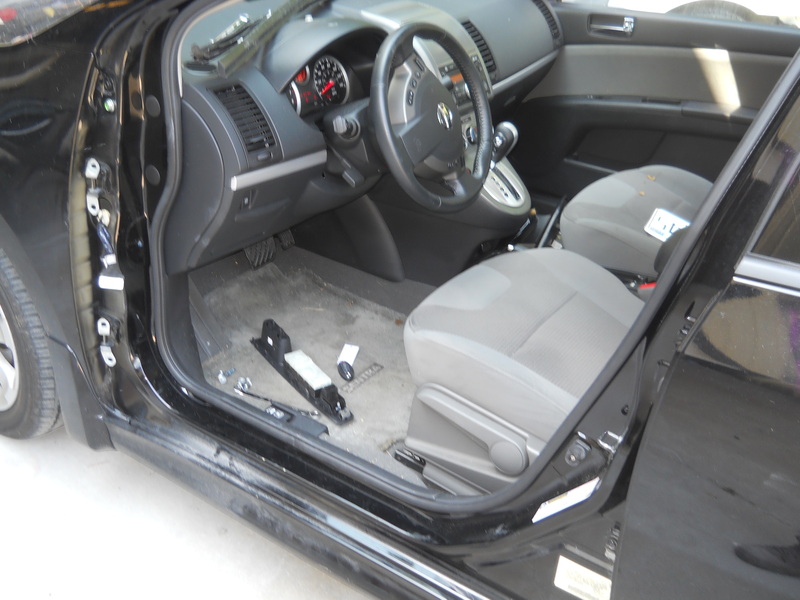 Here is the car with the freshly repaired door installed. Looks good doesn’t it? … a lot better than the dented door we took off the car. Now that the dent has been repaired this Sentra is as adorable as it ever was. This Nissan Sentra is a ‘tweener. The driver door was damaged from someone backing into the car in a parking lot. 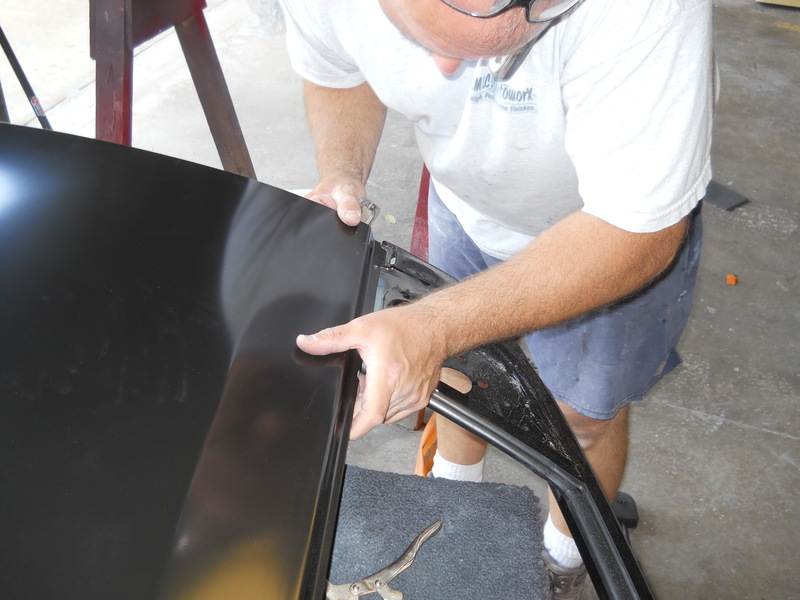 The door was too badly damaged for me to pull the dent and repair … I know this because I tried that first. On the other hand, the door wasn’t so badly damaged that it needed an entirely new door. 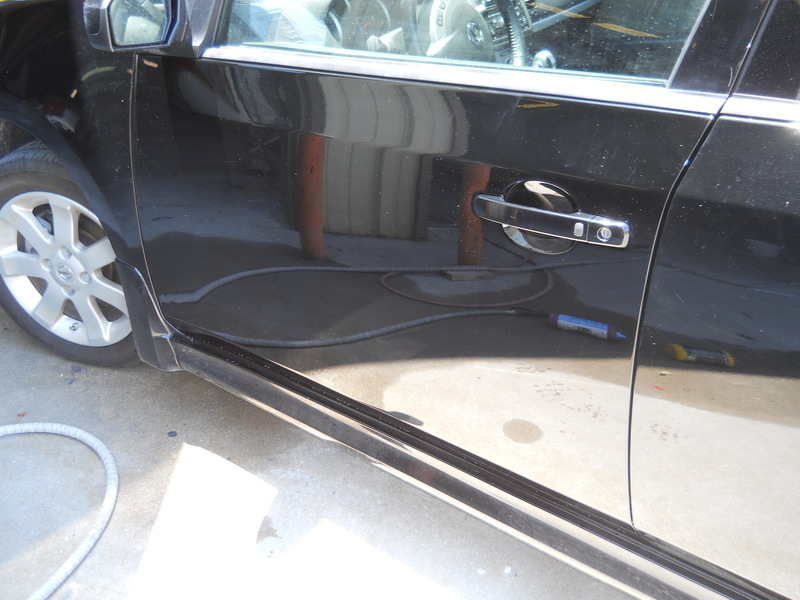 What was needed was a repair between pulling a dent and replacing the door. 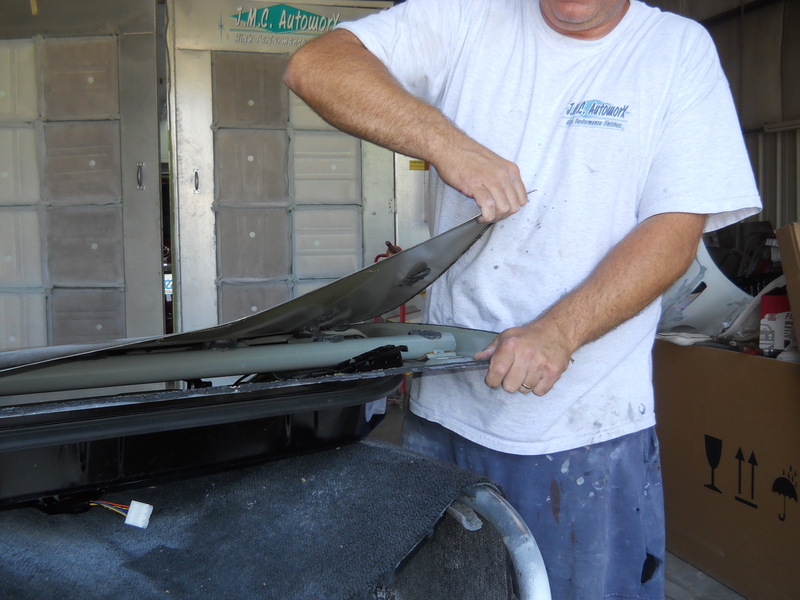 Fortunately there is such a repair … replacing just the skin of the door. The first two pictures show the start of the procedure. 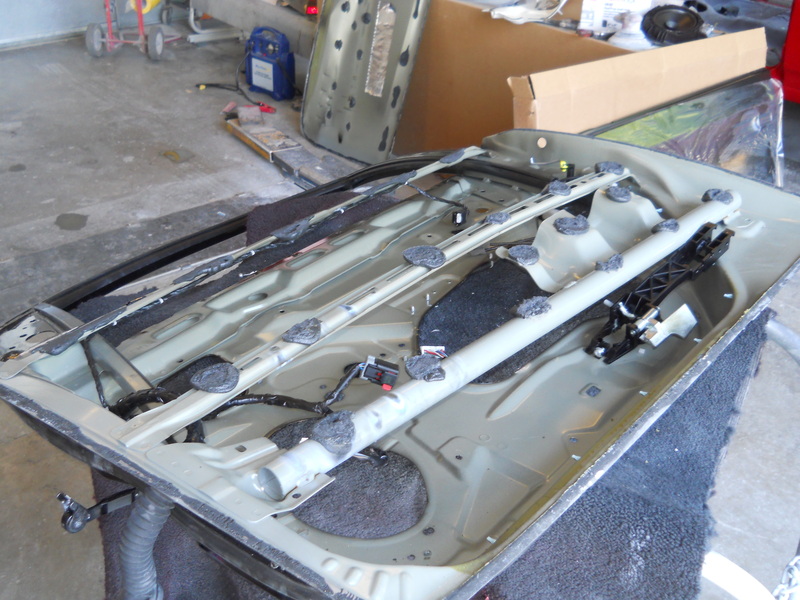 The door is removed from the car and stripped of the glass, motors, speakers … anything that might be damaged in the repair process. The third photo shows me gently cutting the skin away from the door with a grinder. 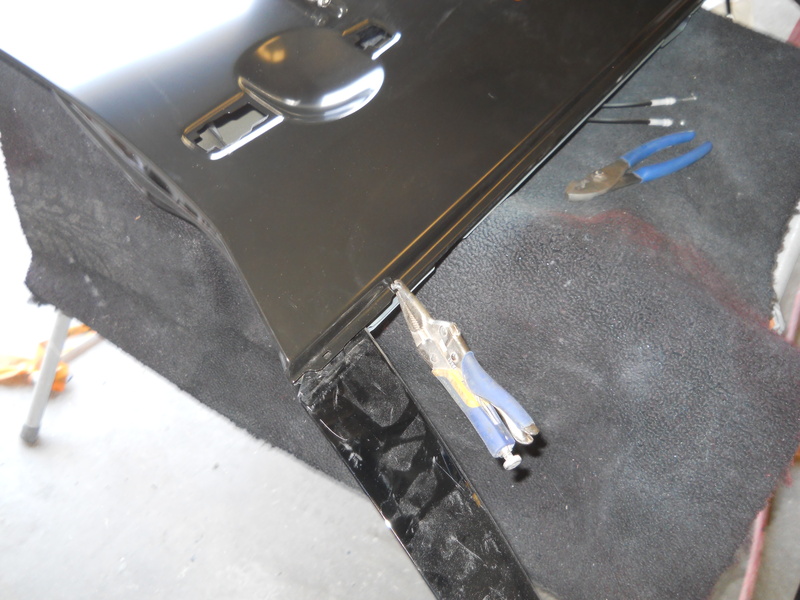 The skin is attached to the structural part of the door with a pinch weld. The edge of the door skin is folded over the door structure, crimped tight, then welded in place. 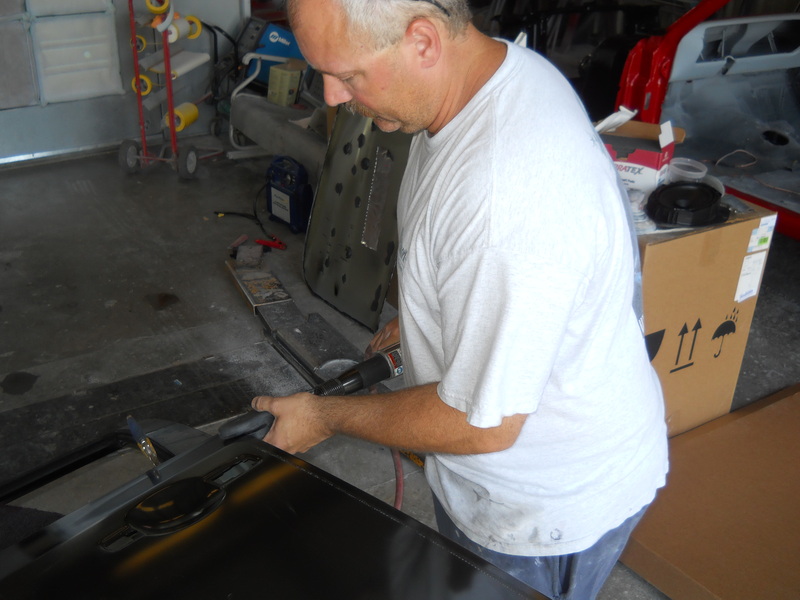 By grinding away this pinch weld I can remove the outer skin of the door. The next four pictures, numbers 4-7, have me pulling the skin away from the door. It sometimes takes a little persuading with a big screwdriver and body hammer, but eventually the skin comes free from the door. You can see the naked door in picture eight. In picture nine you can see the replacement door skin. The installation of the skin is the same procedure, but in reverse. Pictures 10-12 are of the door skin being put into place, aligned then clamped down so nothing can move. It is important that the skin be properly aligned on the door structure so that the folded and crimped part of the skin overlaps the door structure sufficiently to hold firmly on all sides. 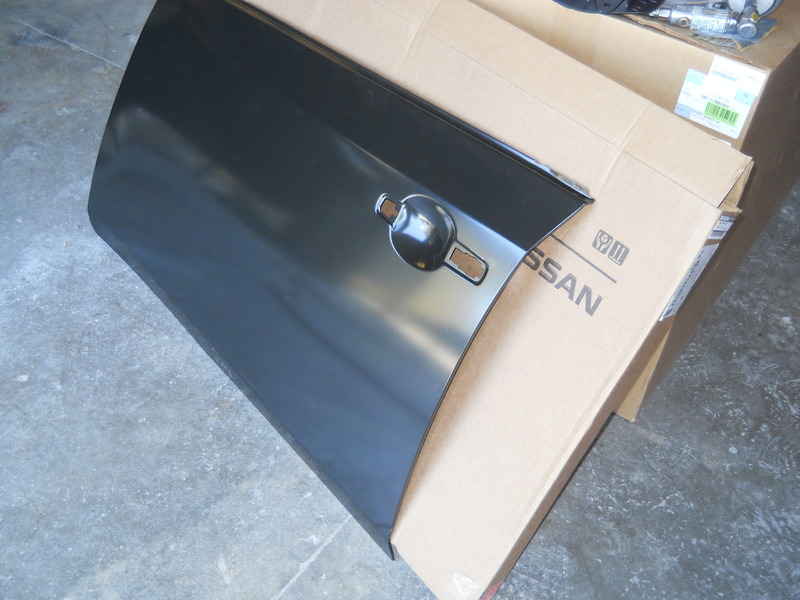 It also makes aligning the door much easier if the skin is properly installed. Most metal work on a car involved some amount of beating and banging. Removing the skin did, and putting it back on did as well. 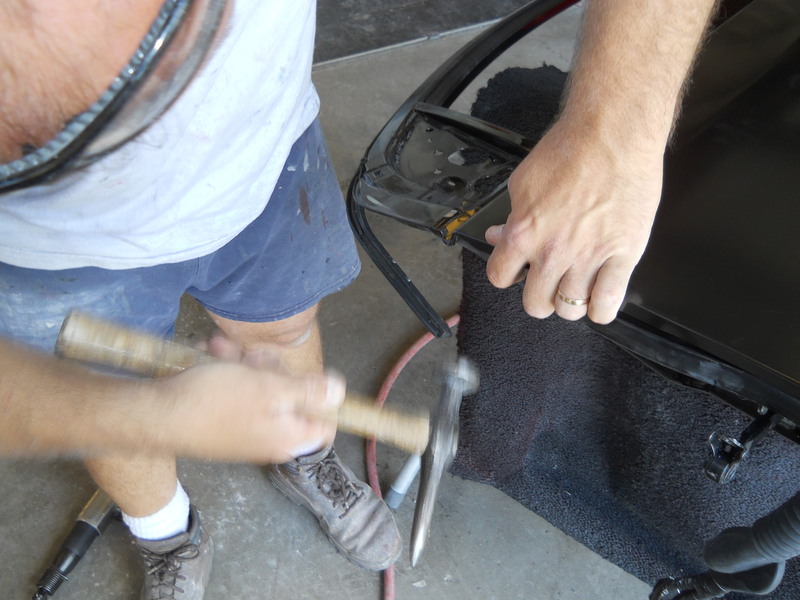 In picture 13 I am beating on the crimp point with the body hammer, bending the skin over the door structure. This is so I can get my handy-dandy skin crimping tool started so it can do it’s thing. 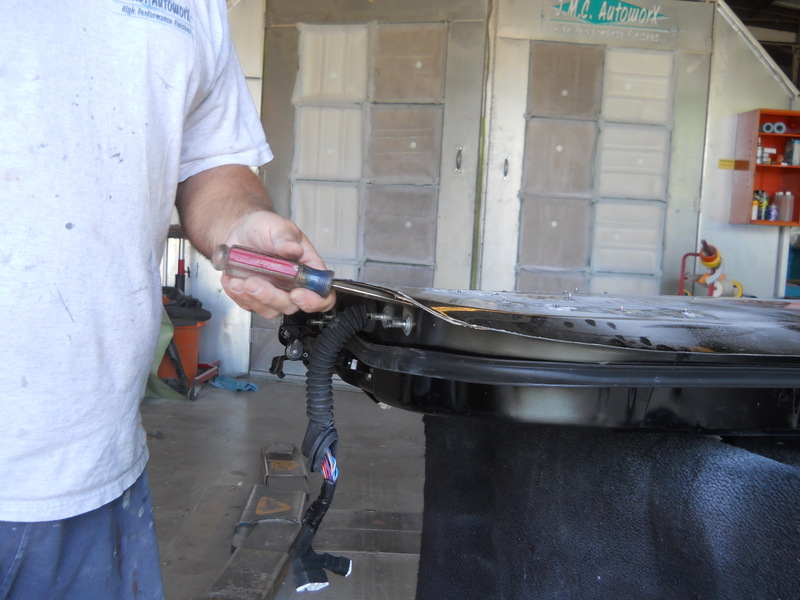 This air powered tool, shown in picture 14, makes short work of crimping process. And to think, people used to do this work with a hammer and dolly. A few spot welds later, to make sure the new door skin stays on the door, and the freshly repaired door is ready to finish. All that is left is to repair any small dents in the skin, a by-product of the installation. 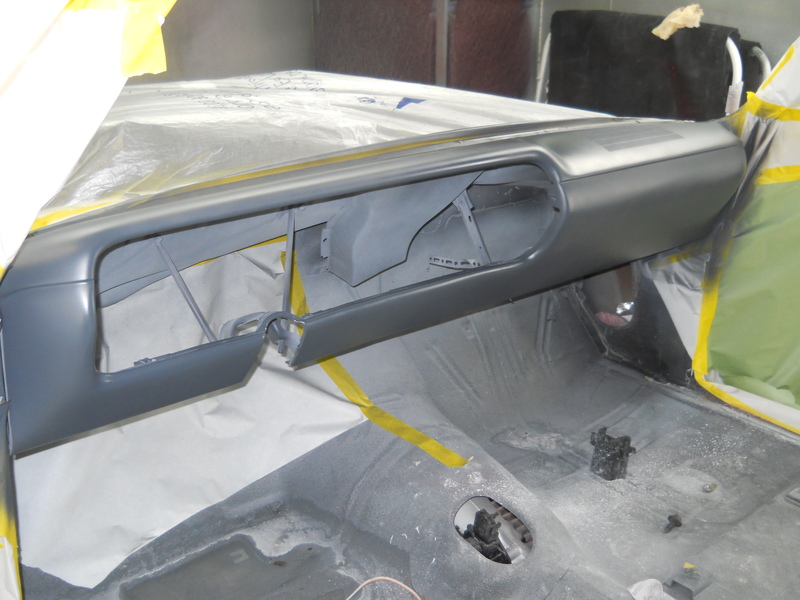 The last photo, number 15, shows the door in the booth with a bit of primer sprayed on the areas where I used a thin layer of body filler to smooth a few shallow ripples pulled into the metal when it was crimped down. There may be more than one way to skin a cat, but there is really only one way to skin a door. And you have just seen how it’s done. 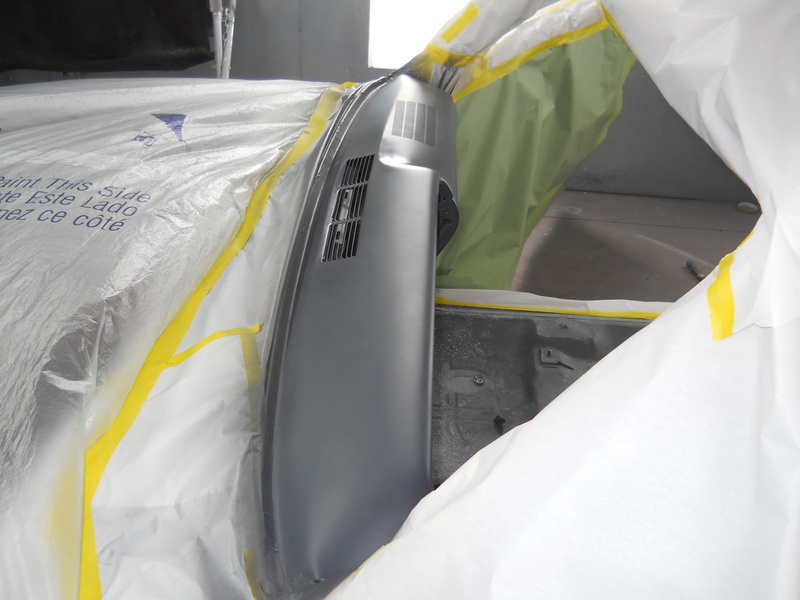 Yesterday we started wet sanding the Chevelle as we transformed a merely great finish into a High Performance Finish. 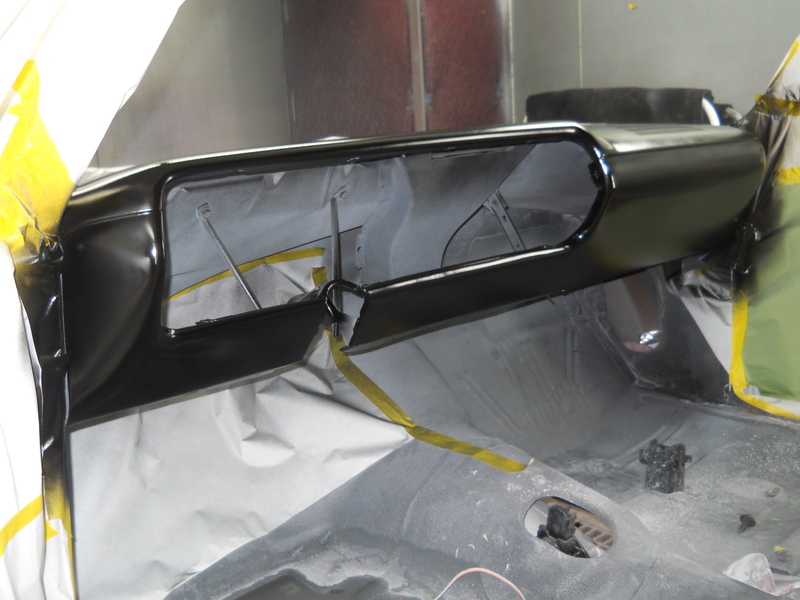 Today, we finished the wet sanding and polishing … and now this paint has reflections so sharp you could cut yourself. 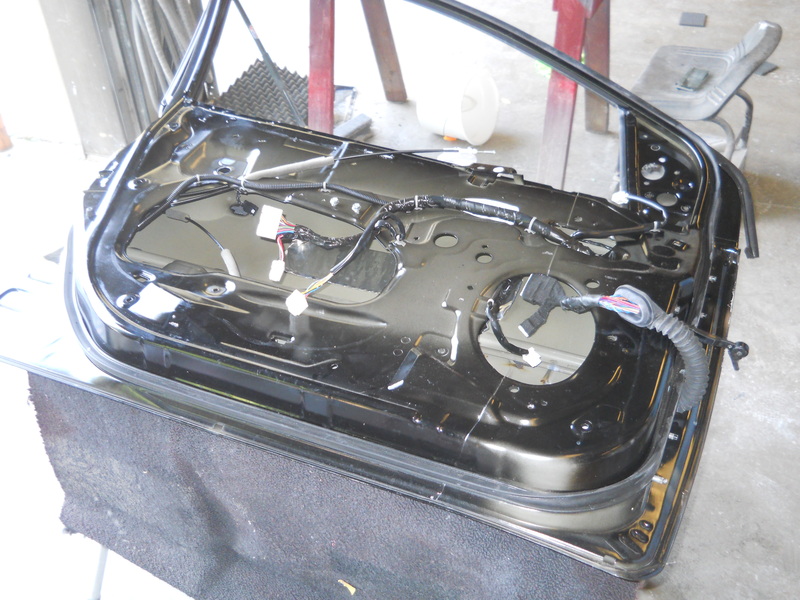 The first photo shows what the paint looks like after we finished wet sanding the car. 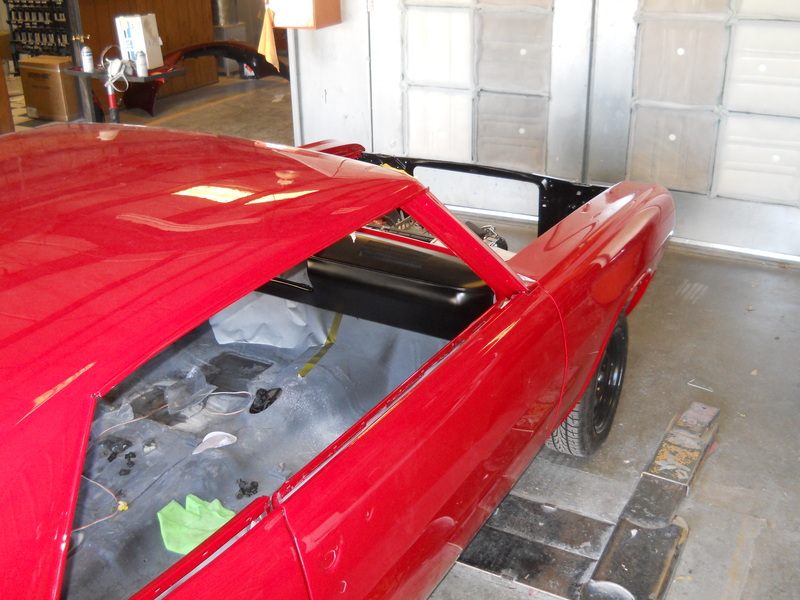 The car is first sanded with 1000 grit sandpaper, then completely sanded again with 2000 grit sandpaper. The abrasives on these papers are so fine the paper actually feels smooth to the touch, but the papers are still enough abrasive enough to cut and smooth the paint. No matter how fine the sandpaper, sanding fresh paint is obviously going to remove the shine … so the next step is to put it back. 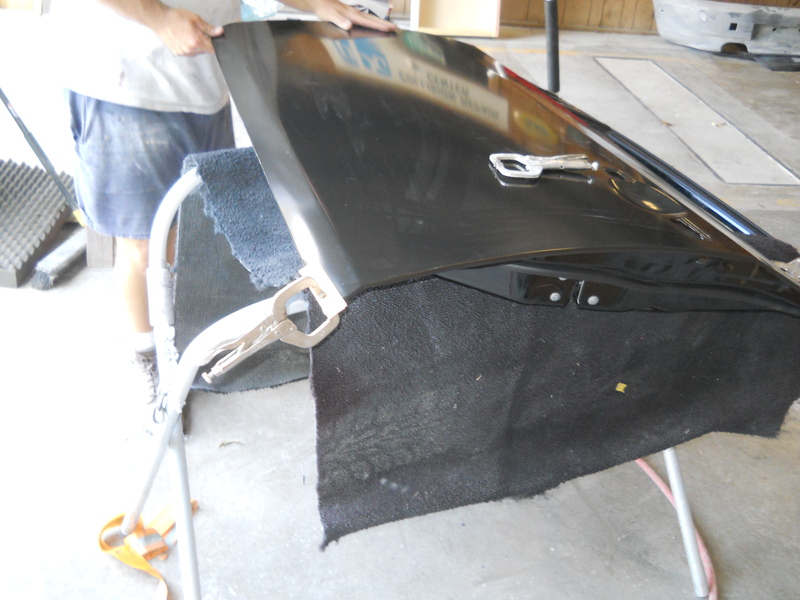 The next four photos demonstrate how you use a polisher to put the shine back after sanding it off. 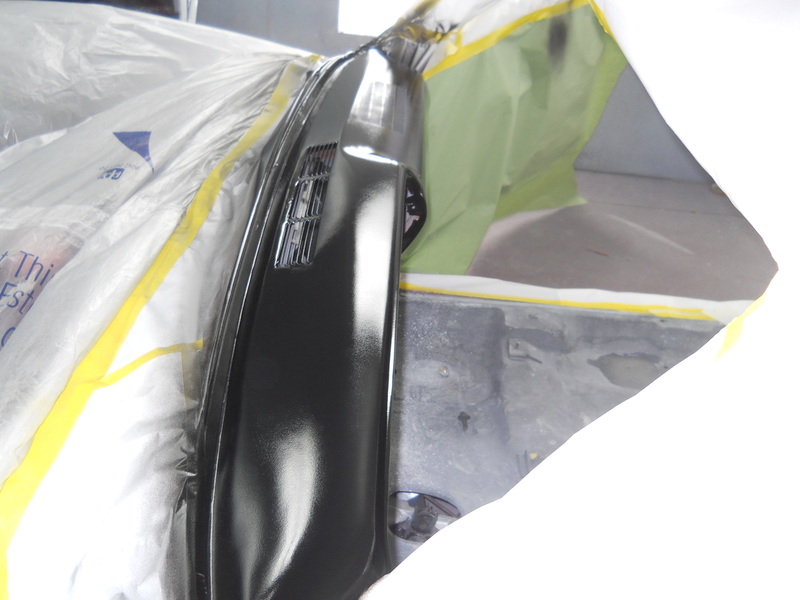 Like wet sanding, the paint is polished using progressively finer polishes. 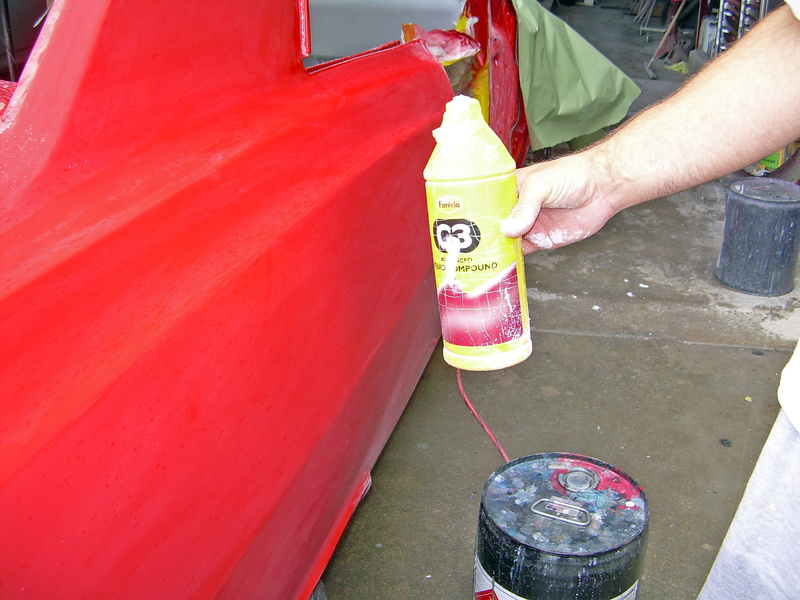 The first step is a heavy cutting compound that removes the sanding marks, but itself leaves swirl marks in the paint. This is the step seen in these photographs. 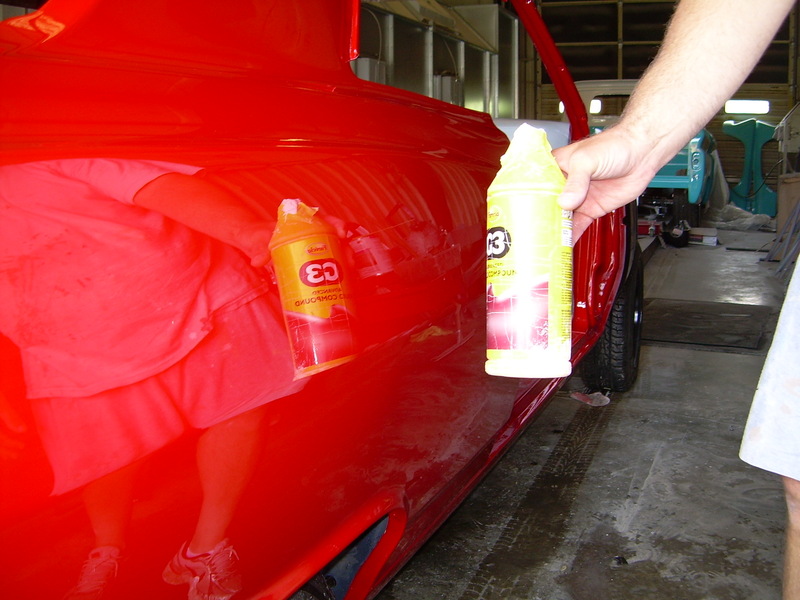 After the sanding marks are removed, the car is polished again with a finer compound which removes the swirl marks left by the cutting compound. After this step the paint looks very, very, good. But for the High Performance Finish we go even further, using a third and even finer compound to bring the shine up to the highest level possible. In the second photo I am dumping out an obviously carefully measured amount of polishing compound. It looks like a great glob of it, but I will smear it around a bit before I start polishing. The third photo has me giving the compound a squirt of water. Not all compounds require the water but I find this compound works better if I add a bit of water to help it remain smooth and not cake up on the buffer pad. 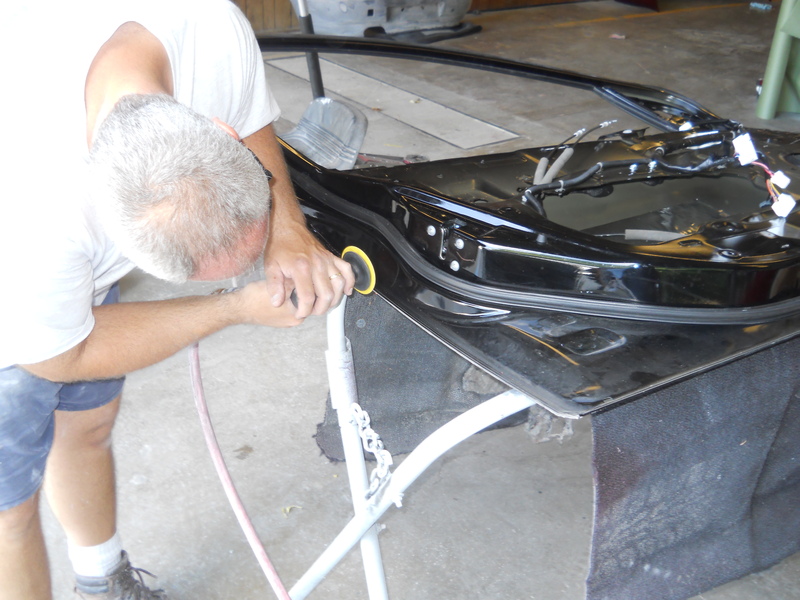 The fourth and fifth photos show me working the paint with the high-speed polisher. 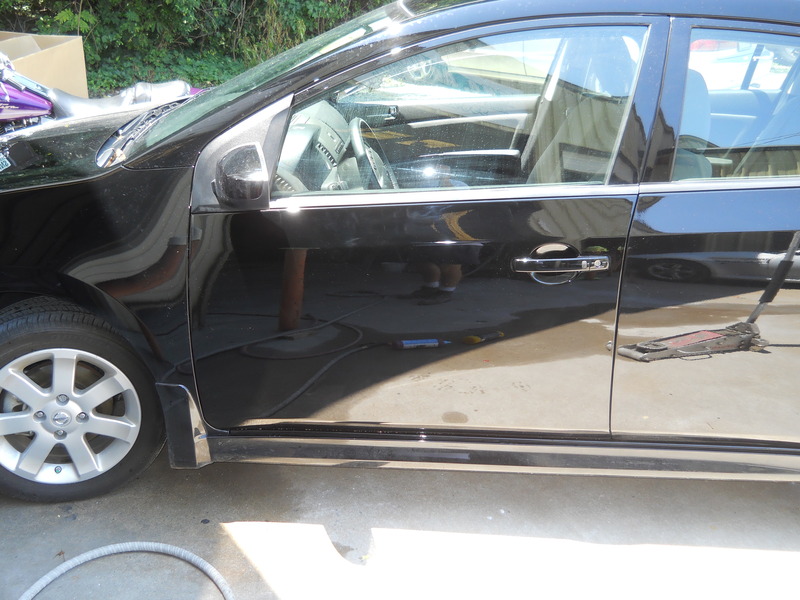 The entire car is polished, one section at a time until the entire car is polished. The I switch to the next finer polish and the entire process starts over again. I notice in the fifth picture I look a little red in the face. I think that is because the car is red but also because it was hot out there today. The last four shots, numbers 6-9, are of the car after all five steps, two sanding and three polishing, are complete. The paint shows its maximum depth and the reflections are crisp, clean and razor sharp. Take a look at the last photograph. There is nothing sneaky or tricky going on, that is exactly how the camera captured the moment. Now that is a High Performance Finish reflection.